Multiplex: Enjoy Your Show is sold out — maybe? 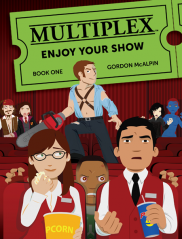 Multiplex: Enjoy Your Show (Book One) is now sold out at the publisher (a.k.a. me) — assuming, that is, that the Multiplex: The Revenge Kickstarter is successfully funded, and the copies of Book One reserved by backers at the “Just Three Books” and “Trilogy Pack” levels are sent off. You can still pick up copies of Book Two with your Book Three reward package, read the eBooks… or, you know, obviously the website still exists! The “Story So Far Pack” includes Book Two, Book Three, and the eBooks for Book One, though, which gives you all of the bonus material except for the print-exclusive “Prequel” story from Book One. Amazon still has a handful of copies of Book One left, too — as well as Multiplex: There and Back Again (Book Two) — but I’ll start looking into reprinting Book One if/when Book Three is successfully funded. There are a lot of hurdles to figure out with reprinting Book One, particularly the printing cost, but if I do get it reprinted I’ll make sure Book Three backers will be able to “upgrade” their reward pack to add a copy of Book One, even after the Kickstarter funding period has ended. But you don’t need Book One or Two to enjoy Multiplex: The Revenge! While I would recommend starting with Book Two, at least, there will be a “The Story So Far” segment at the beginning of Book Three to help new readers (or people who haven’t read these older strips in a while) get up to speed, just like there was at the start of Book Two. You can read Book Two’s segment over at Kickstarter, if you’re curious. Posted in Etc., Merch | Comments Off on Multiplex: Enjoy Your Show is sold out — maybe?